I took a road trip with a buddy to scope out some places for a fall photography meet. Out of all the places on the East Coast we could have gone, West Virginia sounded like the most scenic and least expensive to visit. The foliage was just starting to turn in September due to a drought. 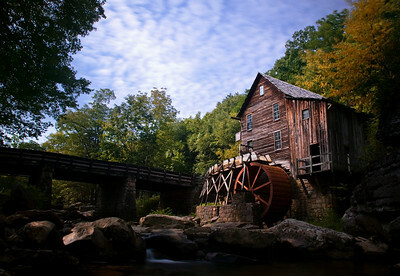 Usually there is more water flowing around the mill pictured above. 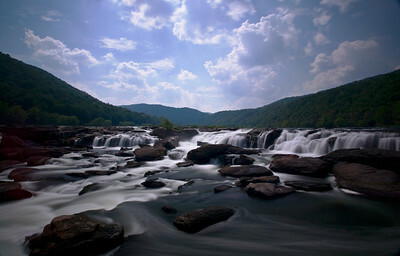 Babcock is definitely a place to put on your WV travel agenda. We stopped at a tourism guide facility and were told about Sandstone Falls – this is actually one of my favorite places to shoot now. If you trek into areas that look off limits, you’ll find all kinds of photographic opportunities and angles to shoot the falls. Again, we were there in the midst of a drought and the river was running a bit low. The New River Gorge bridge is a big attraction. Once a year they open the bridge to base jumpers. When the water is higher it is also a place to see white water rafters paddle by. 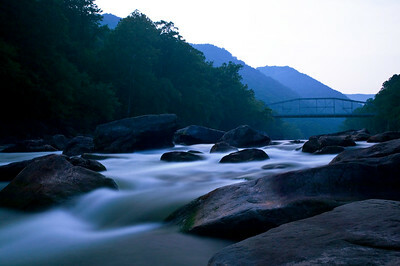 The image above was taken from beneath the bridge – that isn’t the New River Gorge bridge in the photo.